The captured Messerschmitt Bf 109 G-6/trop, WNr. 16 416, in USAAF colors. The fighter was captured by American soldiers on 8th May 1943 at Soliman airfield. Originally it belonged to the 4. Staffel of JG 77. The aircraft was dis-assembled, shipped to the U.S.A., re-assembled by the North Amerian Aircraft company, and subsequently flown to Wright Airfield. Note the tropical filter, the re-painted surfaces and the missing head armor. Photographs of Bf 109G-6/trop WNr. 16 416 via Messerschmitt Bf 109G/K, Vol. II, by Krzysztof Janowicz, Kagero Publishing, Lublin, 2005. ISBN 83-89088-92-4. Major Frederic Borsodi served from 1941 to 1943 as a second lieutenant in the African, Sicilian, and Italian campaigns, completing 130 missions as a P-40 pilot. His flying experience with the P-40 in the M.T.O. probably formed his basis of comparison of the Bf 109G-6/trop and the US Army Air Forces fighters. He became chief of fighter testing from 1943-45 at Wright Field in Ohio. He was the first man to witness the compressibility shock wave on an aircraft wing while diving a P-51 plane from 40,000 feet. He was killed on January 28, 1945 while demonstrating the first US jet-propelled fighter, the P-80, in RAF Burtonwood, England. The tail of the plane wasn't properly insulated and the plane blew up. As a result theYP-80A was temporarily grounded. 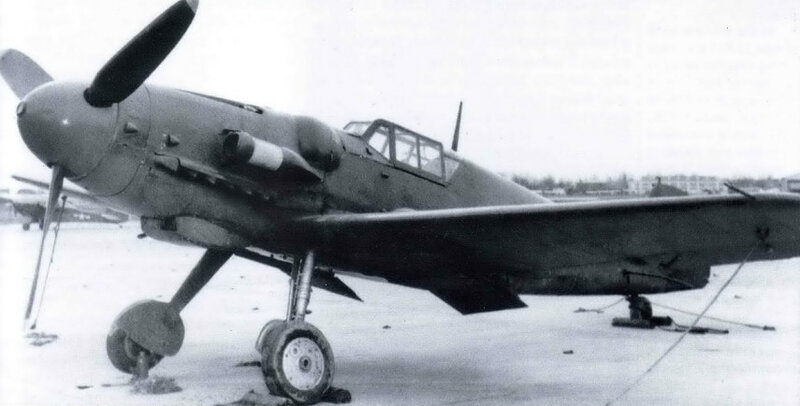 The purpose of this report is to submit preliminary pilot`s observations on a captured ME-109G fighter airplane. rudder and ailerons which are fabric covered. The landing gear retracts completely into the wing, the tail wheel is non-retractable. The engine is a twelve cylinder, inverted vee, liquid cooled, Daimler-Benz DB rated at HP. mately that of the standard combat model. to the left of the pilot which is difficult to reach and awkward to operate. used almost constantly while taxiing. straight course during the take-off by use of the rudder alone. The initial run is rather uncomfortable because the vision ahead is so restricted in the three point position. No specific climb checks were made but the climb characteristics seem to be very good. The initial rate of climb is excellent. d. Handling and Control at Various Speeds. even with the stick full back the control does not feel adequate. low speeds and high power to keep the ship trimmed. The ship is directionally and longitudinally stable and seems to have neutral stability. stall with wheels down and full flaps is about 150 KPH indicated. high speeds. At cruising speeds the controls are very light and all normal aerobatics may be performed easily. h. Changes in Trim when Operating Landing Gear and Flaps. There is very little change in trim with the landing gear up or down. The airplane becomes increasingly nose-heavy as the landing flaps are lowered but there is sufficient travel in the stabilizer trim to provide for any condition. On this particular airplane both the noise and vibration were excessive. The propeller is being re-balanced to see if some of the vibration may be eliminated. As mentioned previously, the cockpit is quite cramped. The chief complaint being the lack of adjustment in the foot pedals. air the visibility over the nose does not appear sufficient for deflection shooting. The approach and landing characteristics of the airplane are quite normal. Three point landings are easily made. With full flaps the approach can be comfortably made at 190 KPH with power off. a. Power plant and Associated Equipment. engine is the acceleration. There is no appreciable lag even when the engine is accelerated from idling speeds. The propeller may be operated in either manual or automatic. In the automatic position the engine speed is controlled by the throttle position, the engine is held at constant RPM for any throttle position. Prior to landing it is advisable to switch over to manual operation as the engine RPM tends to fall too low in a power off glide with the propeller control in the automatic position. b. Hydraulic, Pneumatic, and Electric Systems. All systems seem to operate satisfactorily. An emergency system is provided for the landing gear which merely releases the lock pins and allows the gear to drop under its own weight. The ship must be slowed down and yawed from side to side in order to fully extend the gear. No performance tests have been run to date. The rate of climb seems very good and under cruising conditions (30" Hg., 2200 RPM, 9000 ft. P.A.) the airplane indicated 420 kph. None of these instruments have been calibrated. The ME-109G has a high rate of climb and good level flight performance. Its range is very limited as only 105 gallons can be carried internally and flights of over 300 miles leave little gasoline for reserve. It is very light on all controls below 400 KPH but the turning radius is poor compared to our fighters. At high speed the controls become very heavy. The airplane is stable and should be a good gun platform but the vision is very poor under all conditions. The cockpit is cramped but would not be too bad if the visibility were better. 1. Advantages over U.S. AAF Aircraft. The airplane has a higher rate of climb than most of our fighters. The automatic propeller control is good as it automatically gives the proper RPM for a given throttle setting thus relieving the pilot considerably. The gun sight is small, more compact than ours, and far easier to change a bulb. 2. Disadvantages over U.S. AAF Aircraft. It is not as maneuverable, does not have the range, and has inferior visibility to practically all our first line fighters.